A couple of weeks ago I posted about the many different things one could possibly mean when using the word cobbler. I shared a recipe for a biscuit-topped cobbler—which is what I mean when I say "cobbler"—but this of course doesn't mean that I don't eat and enjoy the many other kinds of things that can be identified as a cobbler (I just call them something else). Several years ago a good friend rounded out an early summer dinner with a wonderful little cake that was loaded with summer fruit. I liked it so much that I asked for the recipe. When I sat down to look at it I was surprised to see that it was called "Fresh Fruit Cobbler". 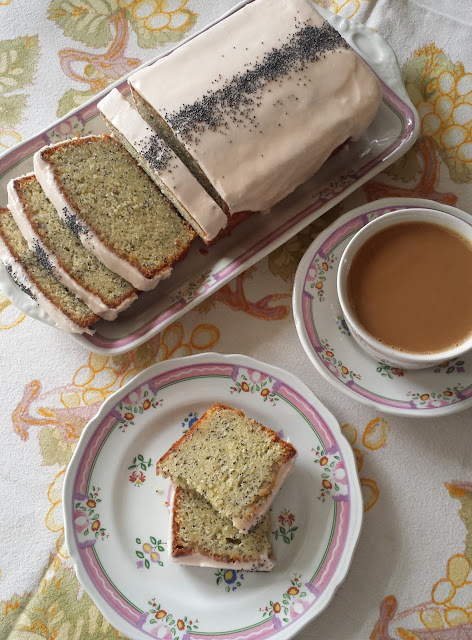 The recipe is from the book The Art of Quick Breads and the author, Beth Hensperger, readily admits in her description of the recipe that it really is much more like the beloved kuchens (or cakes) of German, Swiss and Austrian Baking. Whatever one chooses to call it (I prefer kuchen), it is delicious. A few years later, I ran across a surprisingly simple recipe at the back of The French Laundry Cookbook for Cranberry and Apple Kuchen. The recipe is very similar to Hensperger's "cobbler". I have made both recipes and prefer the cake portion in the French Laundry version and the topping in Hensperger's. The recipe I am posting today is my combination of the two. This versatile and simple dessert can be made with just about any fruit—or combination of fruits—you like. The French Laundry version uses 1/4-inch thick slices of apples and whole fresh cranberries or blueberries. Beth Hensperger suggests sweet cherries (halved and pitted), raspberries, or any of the summer stone fruits (apricots, plums, nectarines, peeled peaches)—halved, pitted and sliced 1/2-inch thick, chunks of rhubarb or slices of pear...even sliced bananas. In the early autumn I have made it with nothing but pitted and quartered Italian Prune plums. My favorite summer variation is 1 1/2 cups of raspberries (a 6 oz. box) with 3 cups of sliced apricots or plums (or a combination of the two). The fruits may be scattered casually over the surface of the cake, or arranged in spirals or concentric circles. When I include berries in the mix, I don't toss them with the lemon juice...I scatter them separately over the cake. I toss the remaining sliced fruits with the lemon juice before spreading over the cake. If you are making an all berry kuchen, just drizzle the lemon juice over the berry topped batter...tossing berries with lemon juice—particularly raspberries and blackberries—will cause them to break apart. When you build the cake you will look at the quantity of fruit to be spread over the batter and probably think that it is too much—particularly when compared to the measly looking amount of batter in the bottom of the pan. But when you are eating the cake you will discover that the ratio of cake to fruit is just right. This kuchen is best served the day it is made. I think it is at its peak a few hours after it has been removed from the oven. At that point it will have had time to cool down, making it possible to really taste the fruit. Also, the kuchen will have begun to absorb the fruit juices, making for a soft, tender and moist cake infused with fruit flavor. On the second day, the cake portion will have absorbed more moisture and depending on the fruit—and the person eating the cake—it could be described as a bit soggy. In this state it is in fact a bit more cobbler-like (for those who think of cobbler as a cakey concoction), and is still quite tasty. In reality, it is unlikely that there will be any kuchen left after the first day...but, if there are leftovers, this dessert then becomes what I would call a perfect breakfast. Preheat an oven to 350ºF. Adjust rack so it is in the lower third of the oven (see notes). Butter a 10-inch round cake pan. Line the bottom with a round of parchment, butter the parchment and flour the pan. Set aside. Combine the first four ingredients in a small bowl and set aside. Cream the butter and sugar until light and fluffy. Beat in the egg. Combine the milk and vanilla. Fold in the dry ingredients in three additions, alternately with the milk mixture in two additions. Spread the batter in the prepared pan. Toss the fruit with the lemon juice and spread evenly over the batter (drizzle any juices remaining in the bowl over the fruit). Combine the sugar and cinnamon and sprinkle in an even layer over the fruit. Bake until a wooden toothpick inserted in the center of the cake comes out clean, 40 to 50 minutes. Serves 8 to 10. • Fruit may be any combination of whole berries, halved and pitted cherries, pitted and sliced (1/2-inch thick) plums, apricots, or nectarines, peeled, pitted and sliced (1/2-inch thick) peaches, pitted and quartered prune plums, chunks of rhubarb, or 1/4-inch thick wedges of peeled apple or pear. • In my oven, this cake bakes best if placed in the lower third of the oven. Bake in the middle of the oven if you have an oven with very strong bottom heat. I love this recipe and can't wait to try it!! What a lovely summer dessert. Know I know what to make with all those peaches I have in the fridge! I had the pleasure of having this cake at a cooking class at Olive Tree last night, 08-10-17. It is delicious! My husband has asked me to make it this weekend. The cake I had last night had plums, apricots and red raspberries. I'm so glad you enjoyed the cake! You'll have to let me know what kinds of fruit you use and how it turns out!